Bückoland is about 8 months old (11235 MC days). I have no artistic ability. I usually only kill when I have to (except creepers). My wife used to like to party in the desert at night next to our main base and I'd join her for that... But then she packed up a rack of blocks of diamond/gold/iron and left me. (I think she's about 10km north). My texture pack is default plus a little Monsterley128 (rails,clock,beds,stained terracotta, jack-o-lanterns; and I replaced minecart and chest sounds with silence.ogg) The world runs survival/normal/no cheats on our house's Linux server under msm and for the creative screenshots, I made a local copy of the world. Anyway, I'm into infrastructure; canals, roads, and rails and cartography. 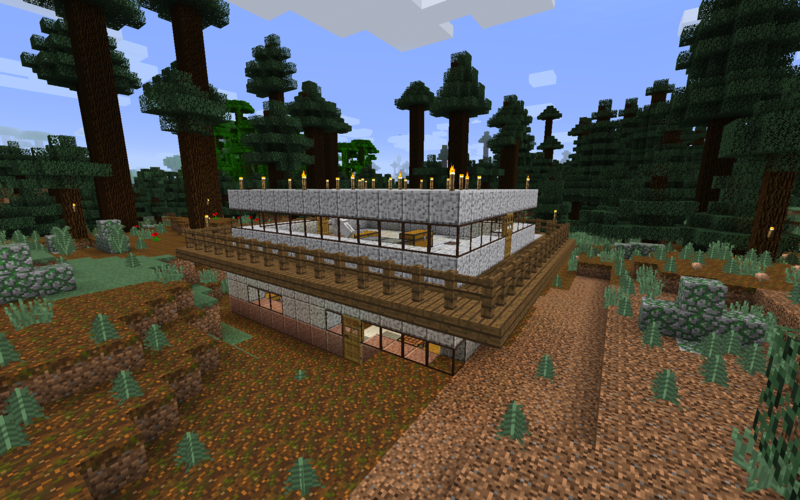 Here's our main haus. The left turret contains the main rail station and the map rooms. The right turret is storage area and mostly empty space. These two tracks merge underneath. There's a flipflop so that arrivals alternate their track. So two people (or person and goods train) can arrive at the same time. The three departure levers, the center lever selects between the two main rail lines. The subterrainian East line (y=11) and the elevated West line (y=68-90). 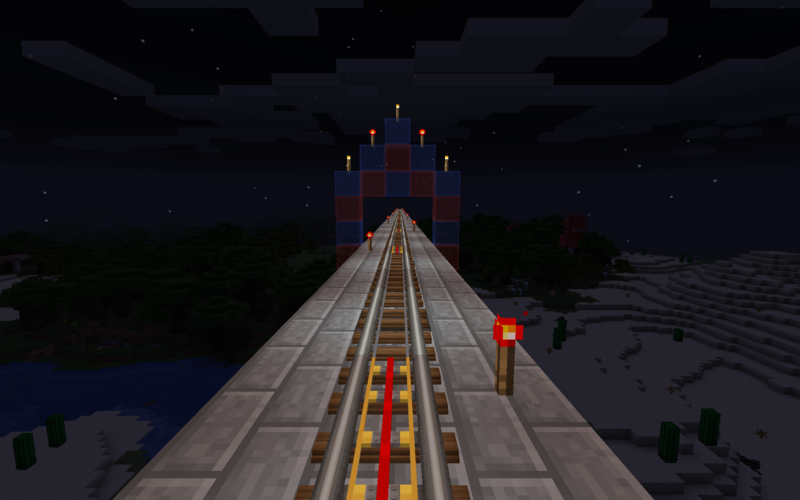 The East line has a lever to select the diamond mine track or the Far East track. 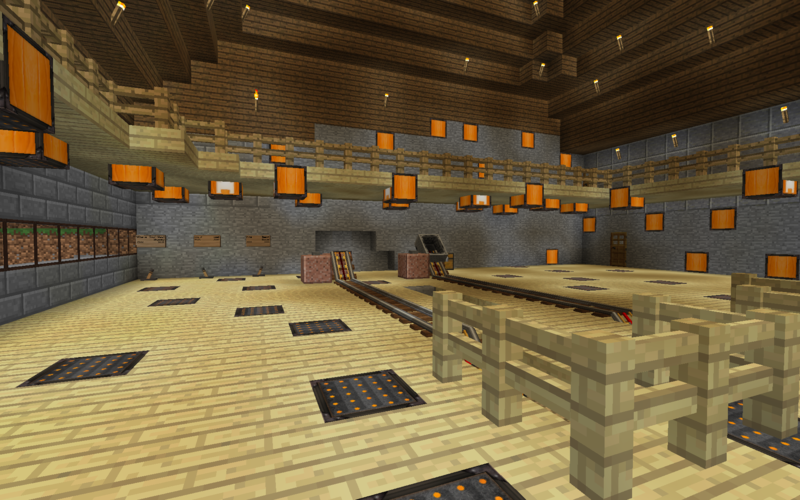 (The mine is abandoned, I do all my mining in the badlands.) The West line has a lever to select the custom back village or the Far West via Badlands station track. My builds are pretty utilitarian. After tunneling east for 8.1k, looking for a badlands, I got bored and dug up and built this FarEast lodge. Here's a nice shot on the west elevated line arriving at the main haus, showing rails, roads, and a lit canal. This is my typical rail build. 3 wide stone brick slabs. A Jack-o-lantern every 5 blocks lights the track. The glass monument marks the 10k point. One change to this setup is now I build 5x5, five rails then five powered rails. I have way too much gold and am low on iron. 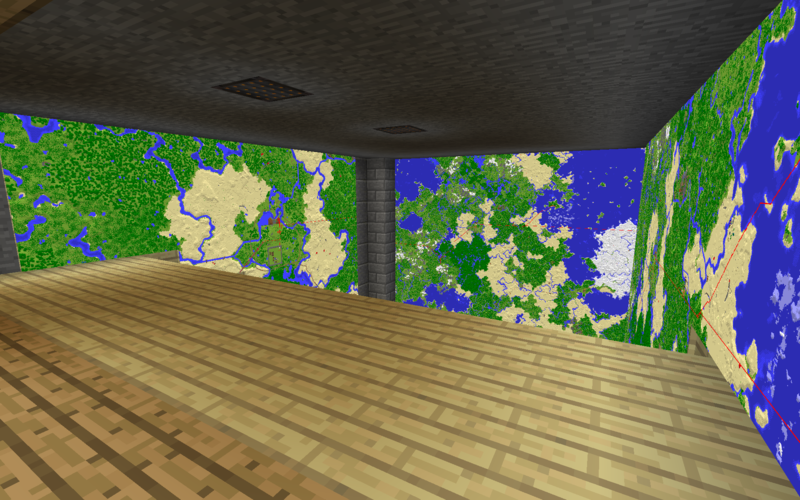 In the main haus, this is one of my map rooms. 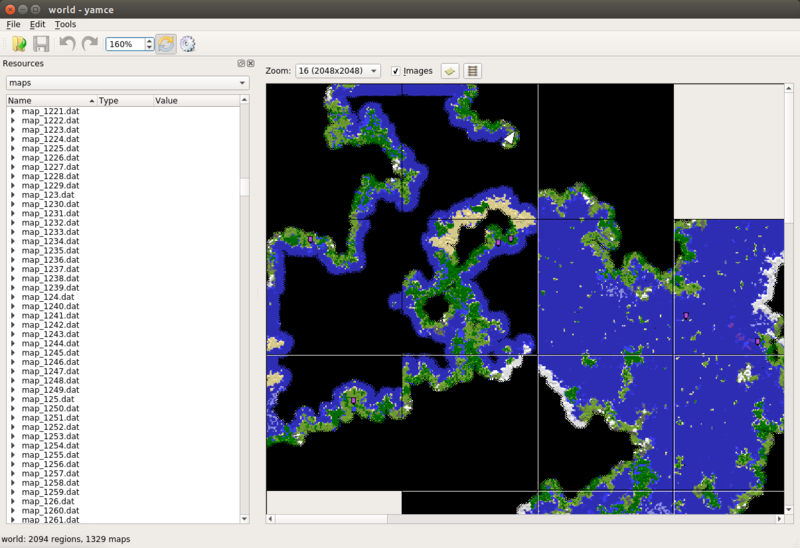 This one shows 3 maps at zoom 0, zoom 2, and zoom 1. (Zoom 3 is on the opposite wall). 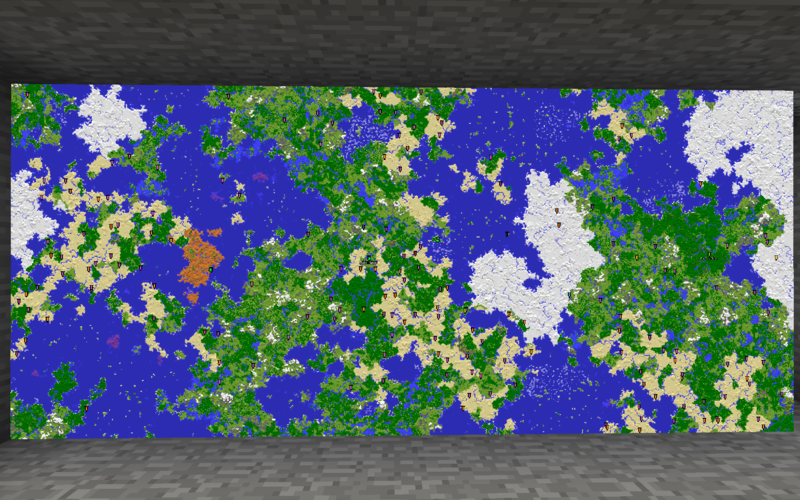 I spent about 4 months making this 9x4 Zoom 4 map wall. Magenta banners are villages and orange is desert/jungle temples. Green are bases and yellow are 5 second rail station stops. 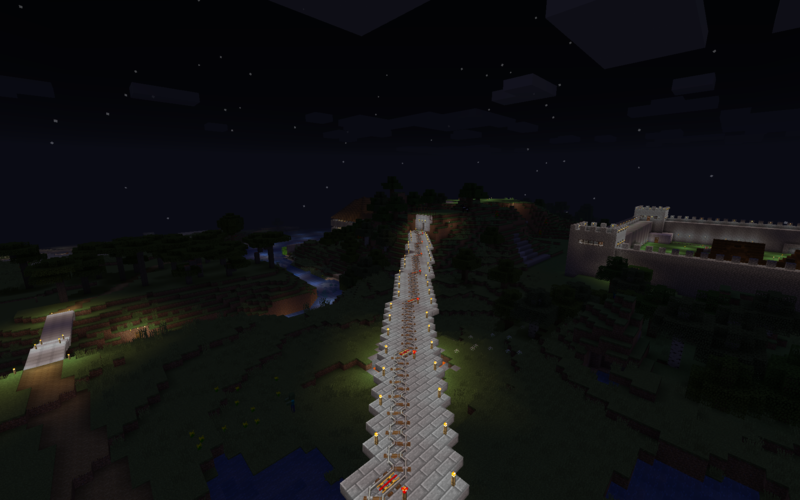 The finished wall lasted literally 6 hours and I blew it out to a bigger one. I wanted to see just how big those edge oceans are, so I've been mapping them in a boat. 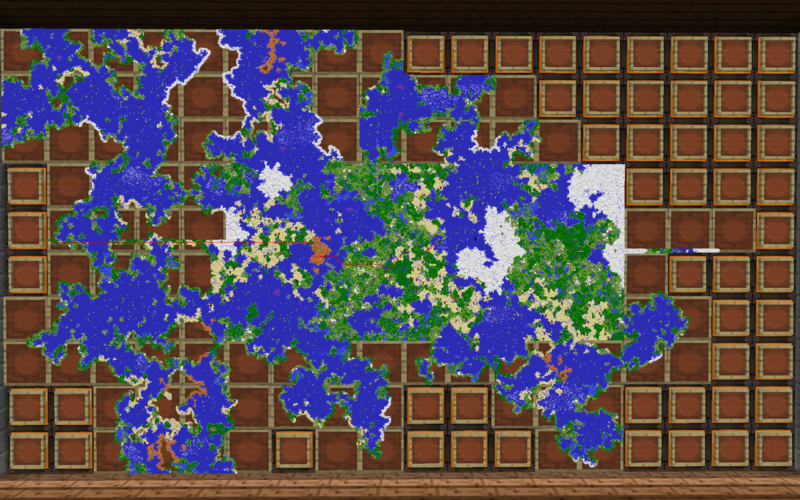 This is my current map wall. I am currently exploring the Northeast oceans. Note the red line crossing the middle, that is my rail line. My main line runs from X = -16334 to 14077, a 58 minute 10 second ride end-to-end. I started writing yamce, Yet Another Minecraft Editor, (Linux/C++) because I couldn't delete the temporary white banners that were marking the end of my rail build progress. 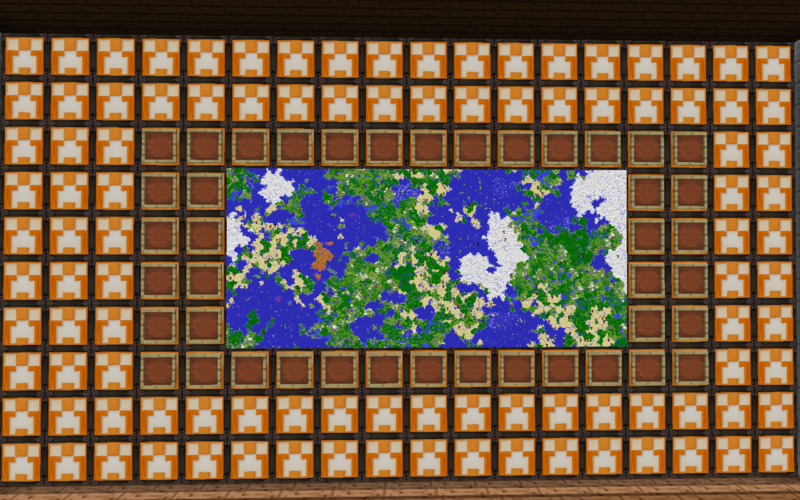 Yamce's feature set expanded to include exporting the map wall as a png. It also scans for rail lines to add to the maps. 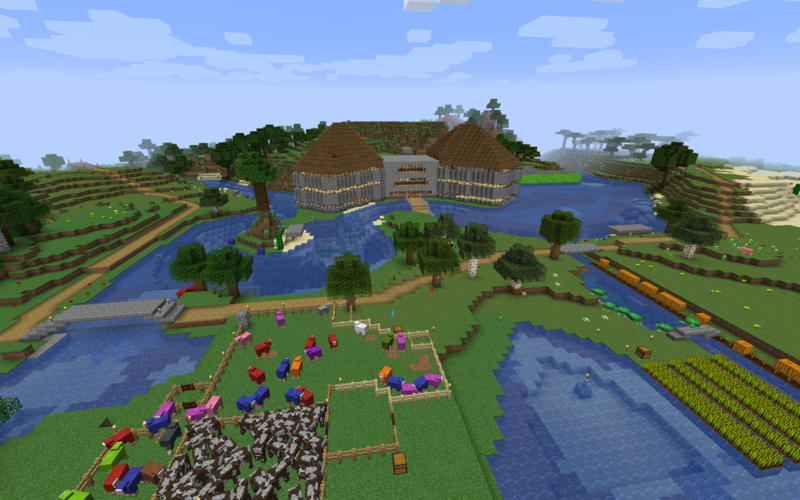 Yamce also can monitor maps and players and updates them when Minecraft writes the files (about every 50 seconds). It is always running on my second monitor now. Here I am working on filling in new maps, I am the white triangle at the top.